Each year recently EWS, the rail freight operator, have operated a series of driver training runs to ensure the continued availability of crews to operate steam hauled railtours. 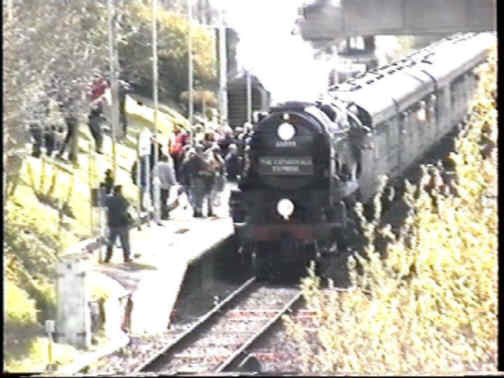 They run from Eastleigh via Salisbury to Yeovil where the loco is turned before returning to Eastleigh via Southampton. 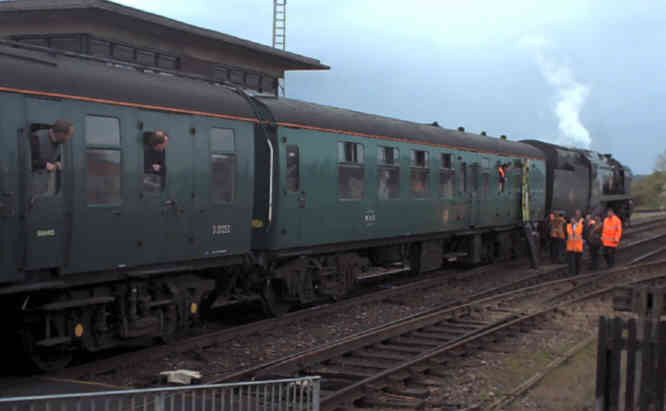 The 2002 runs were worked by 35005 Canadian Pacific, an ex Southern Railway Merchant Navy class pacific, hauling the Mid Hants Railway's Green Train, a set of ex BR Standard carriages painted in Southern green livery. The trains were scheduled to run from Monday 15 April to Friday 19 April, with two trips a day except Wednesday and Friday when only one was booked, unfortunately when I went to see the first run on the Thursday Canadian Pacific developed a problem which led to the train being stopped at Gillingham for repairs. 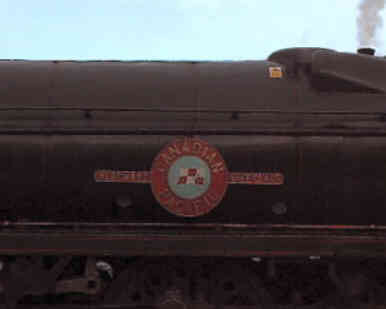 A team from the Yeovil Railway Centre made the necessary repairs but time was short so Canadian Pacific went on to Yeovil to coal and turn with just the support vehicle behind her. The first two photos show her under repair shortly before she was ready to run again. The next shows her nameplate. 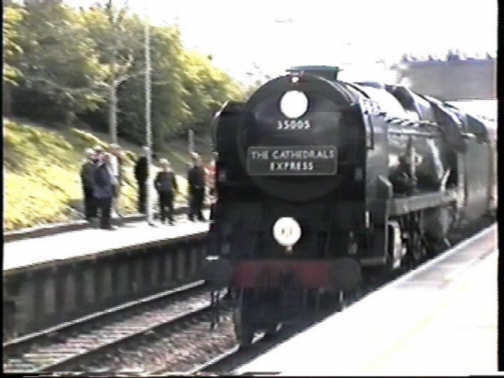 Next is a shot of her running through Gillingham on her return prior to setting back onto her train, complete with the Cathedrals Express headboard and the head code for the Waterloo - Exeter line. 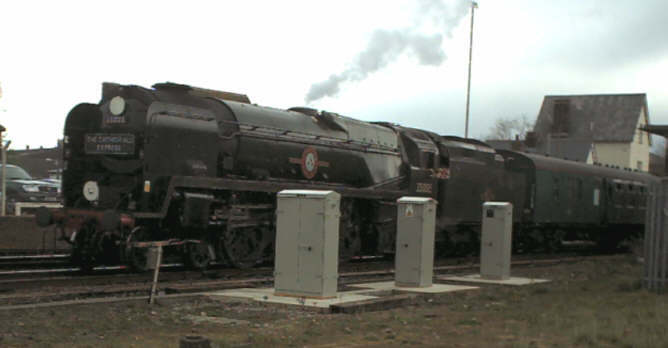 The last two are frames captured from the video showing her leaving Gillingham, some 1 hour 40 minutes late, en route for Salisbury and Southampton. A final misfortune was that the Friday run had to be cancelled due to problems at Eastleigh, so my attempts at getting more photos of her, including ones of her being turned, were thwarted again. There's always next year ! !